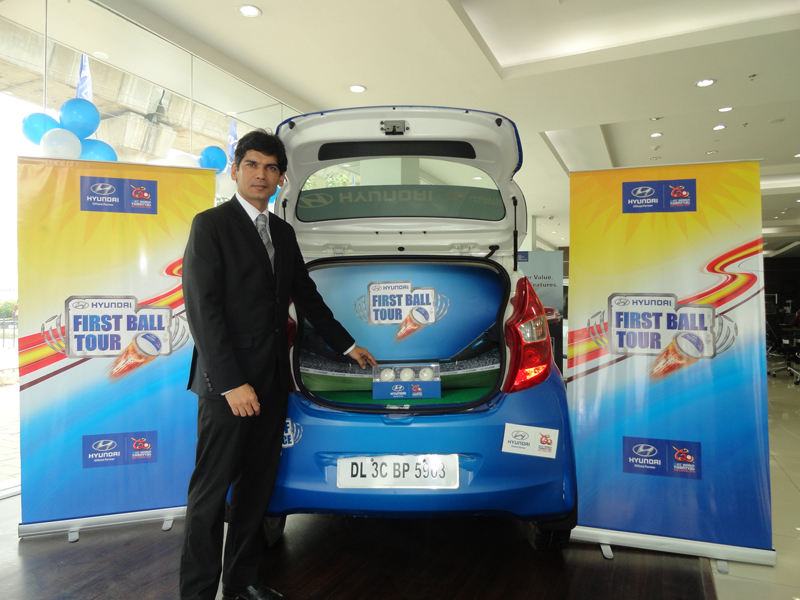 Hyundai Motor India Ltd. on Thursday showcased the ‘First Ball’ for the eagerly-awaited, upcoming ICC World Twenty 20, 2012. Hyundai owns the exclusive rights to showcase the set of Cricket Balls that will be used in the ICC World Twenty20, the first match of which will be played on 18th of September this year in Sri Lanka. The car manufacturer displayed the Cricket Balls in specifically branded Eon. The first ball was showcased from 6th to 9th of September in six cities: New Delhi, Mumbai, Chennai, Ahmedabad, Lucknow and Hyderabad. The main objective of showcasing ‘First Ball’ was to bring together cricket fans and to provide them with a unique opportunity to indulge in merriment of the moments of the World Twenty 20. The showcasing of the cricket balls also helped in building up some momentum for the upcoming landmark cricketing event. Hyundai representatives will hand over the set of cricket balls to the umpires, an hour prior to the commencement of the opening match, which will be played between Zimbabwe and Sri Lanka. It will be up to the umpires which ball they choose to be used in the match. As a part of the World Twenty 20 event, Hyundai Motor India has also showcased the ICC Trophy in a special campaign, dubbed “Trophy Tour”.